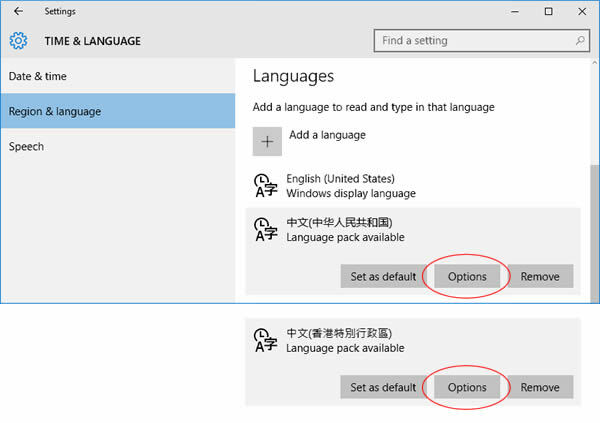 This is a guide to setting up Chinese input methods in Windows 10. 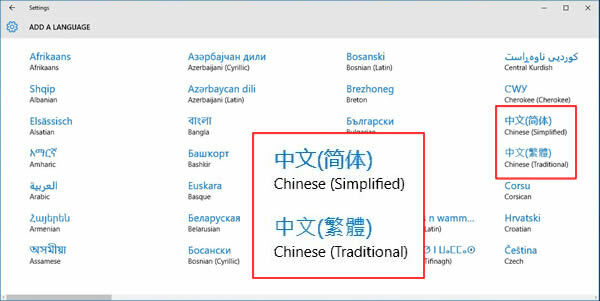 As I explain in more detail in my overview of Chinese language features in this release, at this time I cannot recommend that Windows 7 users upgrade, as many Chinese language features that were missing in Windows 8 are still missing in Windows 10. I plan to write up a new list for Win 10 soon, while expecting (hoping?) to see updates that fix some or all of these problems released in 2016. Meanwhile Windows 8 users should go ahead and install Windows 10, and may benefit from doing so. On later pages I cover handwriting input and other options. But first, the Hanyu Pinyin Input Method! You can sync most of your language settings from a previous Windows 8 or 10 installation if you use the same Microsoft account, and many will also survive an upgrade. But some features will often need to be downloaded again, and you will probably need to tweak your settings. 7. Help files - in English! In my little collage of images on the right are pieces of the Start menu and the Settings panel. Open the Start menu and select Settings. 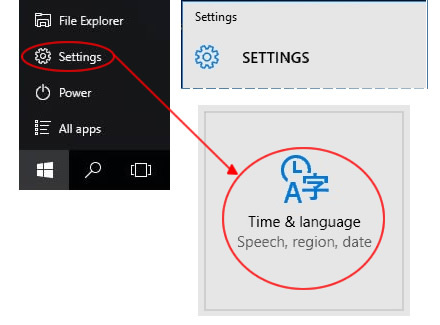 Then in Settings, select "Time & language". "Chinese (Simplified)" actually includes a Traditional character option, and "Chinese (Traditional)" includes a Simplified character option, each with some limitations. I cover this in later pages. Some of you may choose based on which input method you prefer. But it's often very important to make your choice based on the region you are in or communicate with most — mainland/Singapore vs. Taiwan/HK/Macau — to match the encoding underlying your documents and messages. This helps avoid future technical problems, like unrecoverable scrambled messages full of question marks, "tofu blocks", and other garbage characters. To make matters even more confusing, many people in Singapore use the Taiwan or HK locales for Traditional characters, and many in Hong Kong/Macau use the PRC locale for Simplified. And, the Taiwan/HK/Macau settings offer a choice of Big5 or Unicode. It's best to ask people about their settings before sending much, if they know. The default keyboard for PRC and Singapore is Microsoft Pinyin. The default keyboard for Taiwan is Microsoft Bopomofo, but for Hong Kong it's Microsoft Quick (a quicker Cangjie). Click "Add a keyboard" to select another from the menu. A keyboard that has been selected can be removed by clicking on the name and selecting "Remove". "MS Bopomofo" supports Hanyu Pinyin in addition to Zhuyin Fuhao. 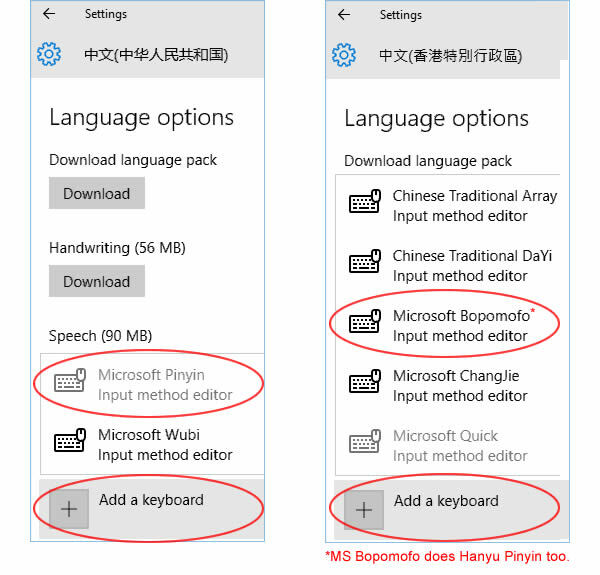 On the next page I will show how to change the "Bopomofo" keyboard to Hanyu Pinyin, and on later pages I will also discuss using this IME for Simplified characters, plus using MS Pinyin for Traditional characters, as well as the display language, handwriting, and speech features. 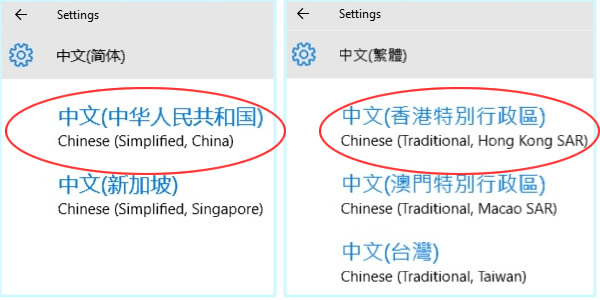 The Cantonese Phonetic input method (Jyutping) was added in an automated update to Windows 10, but it cannot be selected from the menu shown above. See the CPIME FAQ page for help on installing this IME. Now you can click on the name of each input method editor (IME) you've chosen, to get at the Options buttons. Most users of MS Bopomofo will want to read on to the next page, to learn how to switch that IME from Zhuyin to Pinyin. And on subsequent pages, we'll look into what else is in Options. • Help files - in English!